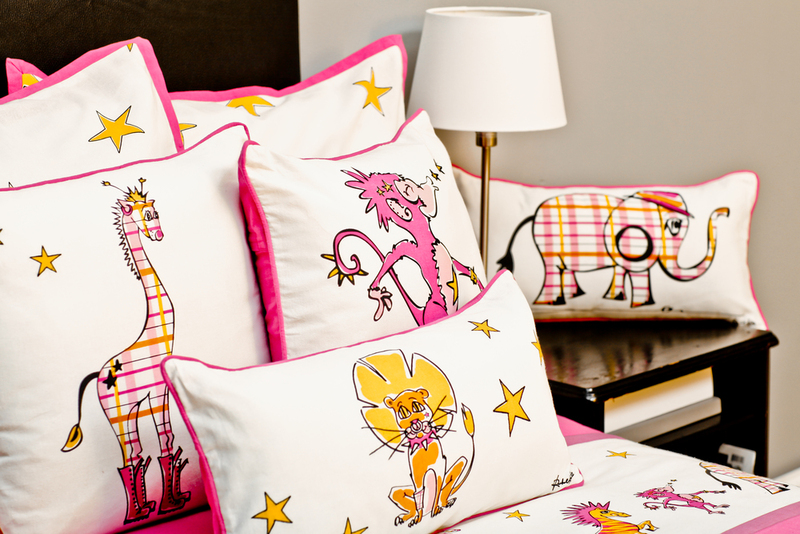 Rachel Kate Kid bedding captures playful jungle animals with a punk rock twist set over a sky of yellow stars. Girls will have a ton of fun with this carefree bedding collection. Let your little "rock star" roam free with this fun and edgy collection. Monkey Decorative Pillow - Pink/Yellow - 18" x 18"
Zebra Decorative Pillow - Pink/Yellow - 18" x 18"
Giraffe Decorative Pillow - Pink/Yellow - 18" x 18"
Elephant Decorative Pillow - Pink/Yellow - 11" x 21"
Lion Decorative Pillow - Pink/Yellow - 11" x 21"